With a matter of hours to go before the month long football extravaganza begins in Moscow, it seems an opportune moment to look at the relationship between the beautiful game and the beautiful subject (geography if you were wondering). This is a topic I have looked at previously, examining the relationship between economic power (through GDP at Purchasing Power Parity (PPP)) and footballing prowess (through FIFA World Rankings). On the eve of the World Cup, it is time to revisit the current state of play. With two web maps, we can look at those who have qualified, past successes of countries, travel distances, and whose talent is overcoming their economic infrastructure. We have seen in the past, and we can see in the above map (full screen here), that footballing-wise, South America and West Africa particularly overcome economic inequalities in comparison to more economically powerful countries in Europe, China and USA. There isn’t much correlation between economic power and football prowess, according to the graph below, with a lot of ‘scatter’. Perhaps the most interest element to this analysis in the graphs and maps are the nations that don’t show a correlation between these two variables. Only Norway, Finland and Tonga hold the same GDP (PPP) Ranking as FIFA Ranking, and only 50 of the 211 nations in this analysis show a ranking difference of less than 15. This perhaps flies in the face on economic logic, and even sporting logic. The more economic power per person, in theory should allow for better facilities, equipment and coaching infrastructure, as well as a social and economic safety net for the gamble of attempting a career in professional sport. However, some countries in particular continue exceed expectations, especially in qualifying for the World Cup. This highlights the great appeal and universality of football in being a great leveller, even if when you aren’t the richest kid in the playground. Perhaps this is the enduring appeal of the World Cup – you play for the country of your nationality (however qualified), rather than in domestic sport, where economic power and reputation of clubs means the best players go to the richest and biggest. There are two first time qualifiers in 2018: Panama who overachieved to qualify; and Iceland, who with a population of just over 300,000 people, have massively punched above their weight to get to Russia. Uruguay has won two World Cups, despite only being a country of over 3 million. Some countries, while not qualifying, should be judged by their over-achievement too – the tiny Faroe Islands with a population of 50,000, are, according to FIFA, a stronger footballing nation than India, a nation of over a million. Meanwhile, while there are probably cultural reasons for this, China, Indonesia and Malaysia are also large under-performers – the potential for game here is not being fulfilled. The World Cup in Russia is another example of this. Despite Russia’s lowly FIFA ranking (66th), the USSR does have a strong footballing history and tradition – though they arguably have underachieved – is footballing wise, ‘due’ a World Cup. But, like Sochi 2014, it is naive to think that President Vladimir Putin isn’t looking to gain political prestige and positive international attention from staging another global event. However, given political tensions between Russia and some ‘Western’ countries, as well accusations of human rights abuse, violent crime, hooliganism, homophobia (see below) and racism – this is unpalatable to some and a tournament not without controversy. From a purely geographical perspective, looking at the map above (full screen here), the sheer scale of Russia and the World Cup in staggering. With venues from the West in Kaliningrad in the Baltic Russian enclave of the same name, to Yekaterinburg, east of the Ural Mountains – they are just under 2,500 km (over 1,500 miles) apart – roughly the same distance of London to Istanbul. Winning a World Cup, is a long journey, even before the tournament itself has begun – however, like it was Brazil, there will be some travelling and geography to overcome in the tournament itself! 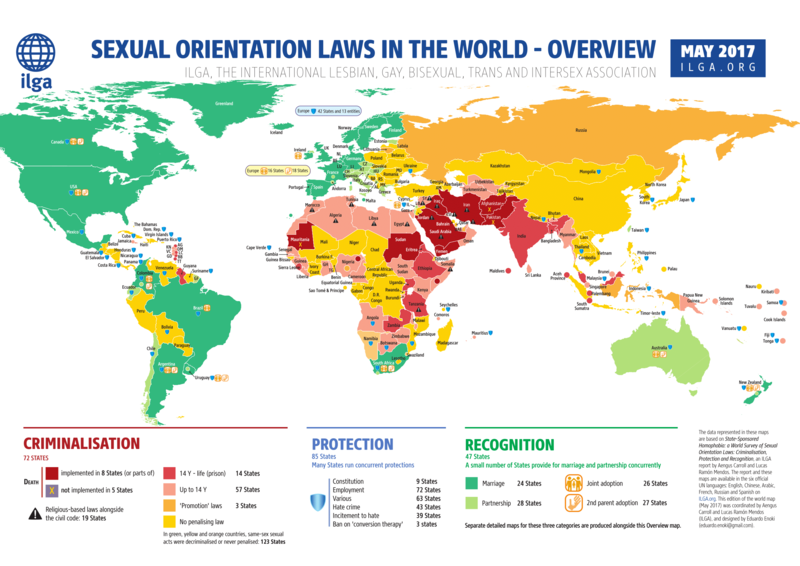 PS: Many thanks for the awesome LGBT map from International Lesbian, Gay, Bisexual, Trans and Intersex Association (ILGA). Previous Post: Eurovision 2018 – Do you need good neighbours?